"Allan Meltzer's Why Capitalism is a thoughtful, historically-based analysis of the roles of government and free markets in a democratic society. Meltzer has thought deeply about the workings of both and has a good sense of which functions each best can be trusted to serve. His analysis of financial regulation in general and of the Dodd-Frank bill in particular is the best I have seen." It was with a mixture of surprise and disbelief in the fall of 2008 that I read journalists' commentaries on the end of capitalism. Many welcomed the expansion of regulation and government intervention and the weakening of market competition as a regulator. Several journalists asked me to comment on the alleged end of capitalism. Did they not see that capitalism had become the dominant form of economic organization that had spread in the past 50 years from a few countries in North America and Western Europe to Asia, Latin America, and now to Africa? 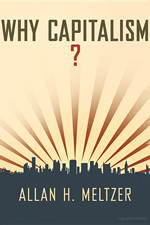 My book, Why Capitalism? offers my explanation of the success of democratic capitalism and the failure of alternatives. Democratic capitalism has three unequaled strengths. It is the only system that achieves both economic growth and individual freedom, and it adapts to the many diverse cultures in the world. Adapting to cultures means that it works well with people as they are, not as someone would like to make them. Democracy works to remove the most common criticism of capitalism-that it generates inequality in income distribution. Voters choose the tax rates and income redistribution that satisfies a majority of voters, never all of them. "Democratic capitalism has three unequaled strengths. It is the only system that achieves both economic growth and individual freedom, and it adapts to the many diverse cultures in the world... Democracy works to remove the most common criticism of capitalism-that it generates inequality in income distribution." Capitalism places the ownership of the means of producing goods and services in the hands of individuals. The allocation of physical and human capital is based on individual decisions. Power is dispersed; abuse of power brings competitors. Mistakes and poor judgments can end in failure. Capitalism without failure is like religion without sin. It doesn't work. 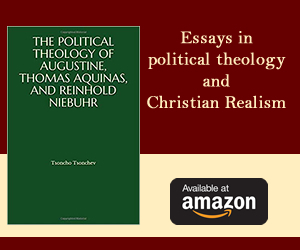 Alternatives to capitalism, whether socialism, communism, fascism, or some religious orthodoxies offer some groups utopian vision of mankind that becomes the one "right path." Utopian visions and orthodoxies must be enforced, so they always bring enforcement, often brutal enforcement. The 20th century saw many such outcomes. None achieved both higher living standards and greater individual freedom. National Socialism, Soviet and Chinese Communism instead produced mass murders of millions. This should have extinguished the appeal of utopian visions, but it has not. Many still believe that social justice can only be achieved by ending or severely regulating capitalism. Experience disputes that notion. Alternatives to capitalism concentrate power in few hands, opening the way to tyranny and brutality, not justice. "Capitalism without failure is like religion without sin. It doesn't work... Alternatives to capitalism concentrate power in few hands, opening the way to tyranny and brutality, not justice." Especially during the past four years in the United States, greatly increased regulation and government spending restricted capitalist development. The main reasons economic recovery from a deep recession was slower than in any postwar recovery are that incentives for risk-bearing diminished and uncertainty increased. No one could know what future tax rates, health care and energy costs, and other regulations would do to future profits. The result: businesses held billions of idle cash and banks held more than one trillion of idle reserves. Instead of investing, they waited for a clearer, less uncertain future and heightened incentives for profits and growth. Increased centralization of decisions added to the uncertainty that is ever present. U.S. experience is not unique. Japan has stagnated for 20 years under large government spending programs. Government operated social welfare states, Italy and Greece, suffer deep decline. The heavily regulated social welfare state guided by government officials has failed. Long ago John Locke recognized that collective action is the efficient response to some social problems. Voters in democratic capitalist countries can vote to redistribute and regulate. Modern economics extends that result by recognizing differences between private and social cost. Much regulation restricts competitive solutions, but regulation often fails to achieve efficient or desirable outcomes because it is subject to capture by the regulated and to circumvention by those most affected. Regulation works best to align private and social costs when it changes the incentives of the regulated. Much regulation, instead, creates incentives for circumvention, crony capitalism and corruption. "Regulation works best to align private and social costs when it changes the incentives of the regulated. Much regulation, instead, creates incentives for circumvention, crony capitalism and corruption." Capitalism is not a perfect solution to human problems. Perfect solutions are utopian; capitalism is a human institution that works with humans as they are. I share the view strongly taken by early Christianity that the great German philosopher Immanuel Kant expressed very well. People are not perfect, so their systems reflect their imperfections. Capitalism and markets are not responsible for what has gone wrong in the European Union and the United States. People, most often people in powerful positions, created the current crisis by offering well-intentioned policies such as programs to increase home ownership by low income families. Agencies of the U.S. government offered mortgage bankers huge profits for lending to low income borrowers with no down payment loans that government agencies bought. For a short time it appeared to work. Then the housing market collapsed. Capitalism disperses and limits power while the alternatives concentrate power in a few hands. Capitalism gives owners and managers incentives to serve the public. Failure to service the public often leads to bankruptcy. Governments do not face the same incentives as private owners and managers. When they fail to achieve the promised improvements in welfare, they do not disappear. Instead they get more money. A few years ago, Canada elected a government determined to reduce the role of government and increase the incentives for economic growth. The benefits should be obvious to all. After years of government regulation and direction, India and China increased market incentives. Millions of people rose from poverty. The success of private incentives is again confirmed. In the spring of this year, much of the press hailed the "Occupy" demonstrators and their criticisms of capitalism. Participants never offered a coherent program. They had no program. And they were ignorant of the facts of history and economic development. In the past 60 years, more people in more countries increased living standards by larger amounts than in any time in human history. Millions were lifted from poverty. The reason: market capitalism and rules for freer trade permitted countries to specialize in producing and selling products that captured their comparative advantage. Freer trade and market competition-capitalism-permitted the gains in human welfare. No other system achieved anything similar while maintaining and expanding freedom. "In the spring of this year, much of the press hailed the "Occupy" demonstrators and their criticisms of capitalism. Participants never offered a coherent program. They had no program. And they were ignorant of the facts of history and economic development." Cultural differences require that there is not a single capitalist orthodoxy. European capitalism differs from Canadian or U.S. capitalism and all of them differ from Japan. State capitalism in China gives a large role to the state. That role has increased in recent years, so I expect the spectacular growth rates of the past 20 years to decline. It is not an accident that the major innovations of modern times begin in countries with greater freedom. Capitalism disperses power and encourages innovation. The critics of capitalism are wrong. As long as people value freedom and growth, some form of capitalism will remain the principal way to organize economies. Political choice will force deviations from time to time, but a free public will find its way back. Capitalism will remain our future. And because we are not perfect, our system will have flaws. Freedom will permit critics to voice their criticisms, successfully at times. Allan H. Meltzer is the University Professor of Political Economy and Public Policy, Carnegie Mellon University and Distinguished Visiting Professor at the Hoover Institution, Stanford University. He is the author of A History of the Federal Reserve, Volumes 1 and 2.